Snowmobiles are a great way to explore the countryside in the middle of winter. There’s something magical about being in a forest, surrounded by a sea of whitened trees. But the glacial, tear-jerking winds that you’re subjected to atop these vehicles has kept many from even trying. Well, you might be able to convince them to join you on your next adventure if you get yourself the Equinox Snowcoach. 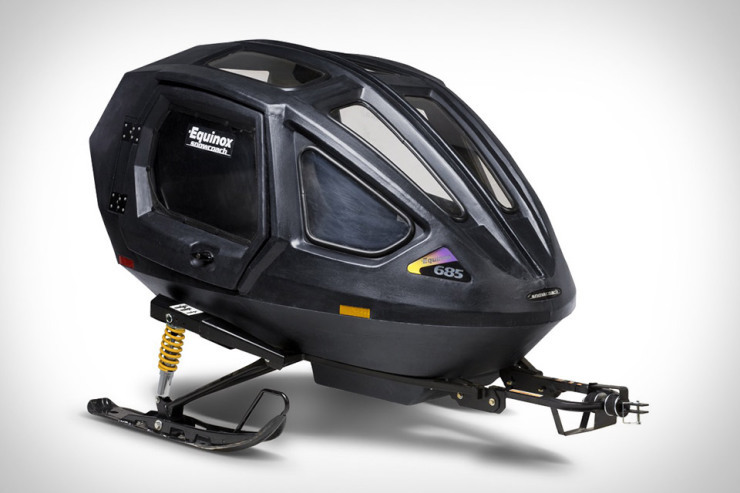 It attaches to the back of your snowmobile, and offers protection from the wind for up to two people. A high performance gas shock suspension, and seat belts, ensure your loved ones are safe and comfortable riding behind you. There are even brake/running lights so that no one riding behind you crashes into you as you slow down. It’s $2,000 and worth every penny if you ask us. In the throes of winter, one starts looking for wintery activities. That can mean a lot of things, like throwing snowballs or making snow angels. But it can also mean undertaking more serious activities, like building an igloo. If you’ve always seen it as an out-of-reach activity, on account of not really knowing how, then take a look at this Icebox Igloo Maker. It’s a snow packing tool which creates the basic cater nary shape necessary to create a self sustaining structure. You create the blocks in place, then remove the mold and move on to the next brick. Once you’ve built 8 rows, your winter home is complete! By David Ponce on 12/03/13 • Leave a comment! Granted that’s debatable, and will depend on the snowblower in question, but the fact that the Snow Wolf Wheeled Snow Shovel features a large wheel at the fulcrum means that you’ll be able to manually lift large swaths of snow in one motion. Much larger swaths than you’d normally be able to manage if you had your arms alone to do the lifting, anyway. 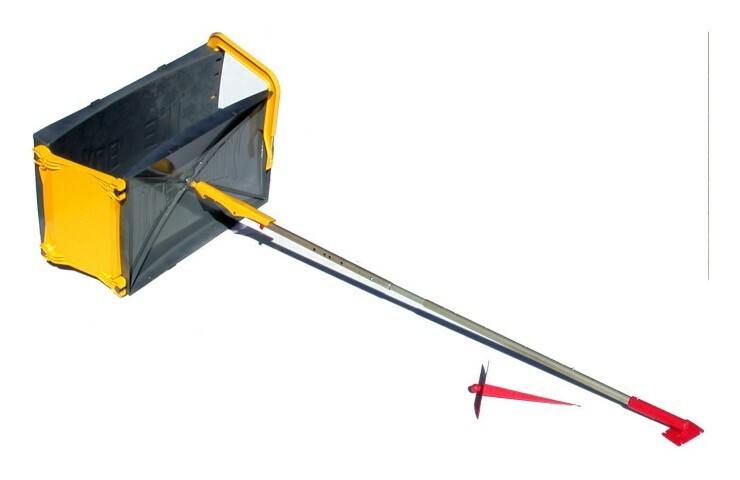 The wide shovel (26 in.) 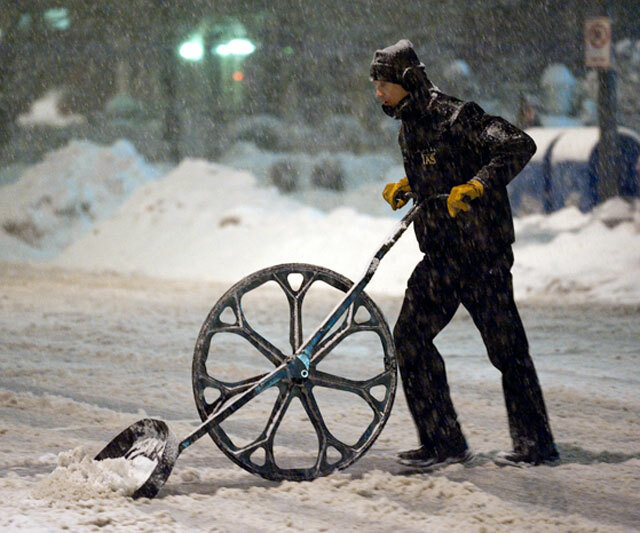 means each pass clears more snow, and the manufacturer claims a 3X improvement on regular shovelling, with less lower back pain and exertion. Also, no noise or gas fumes like your average blower. The wheel, frame and tire are warrantied for life, so you won’t feel so bad spending the $106 asking price. You know big snow is on the way, so now’s as good a time as any to get this. Snowboarding isn’t hard, but it also isn’t the most intuitive sport to pick up. That’s why a company called Streetboardz has developed the Boarder Kontrol system you see above. It’s a braking system that gives novice snowboarders the one thing they always wish they had: instant manual braking. It’s not meant to stay there forever, but like the training wheels on a bicycle, the Boarder Kontrol can give a beginner that extra bit of confidence needed to get started carving snow. Ever Wonder How They Make Snowboarding Half-Pipes? By David Ponce on 01/31/13 • Leave a comment! They use the machine you see above. It’s called a Pipe Monster, and is made by a Swiss company called Zaugg. 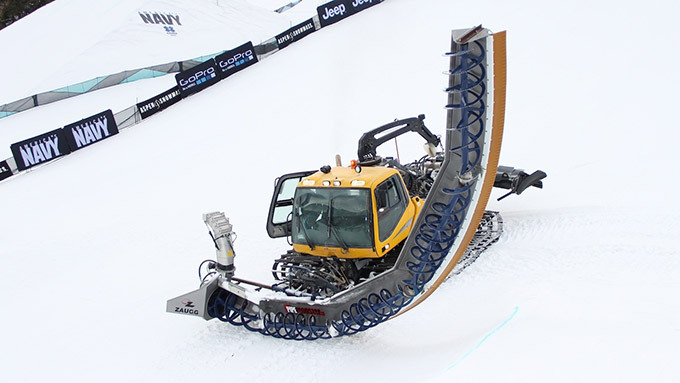 It’s used in all major events, like the X-Games, the Olympics, the U.S. Open of Snowboarding, etc. And it ensures that the half-pipe that is created is uniform and standard. The process goes a little like this: first, other machines make a giant snow bank. Then the Pipe Monster is called in. “Its 22-foot arm features a bunch of augers that go into gearboxes which connect. The snow it chews travels down the arm and into a blower that allows you to control where you want the snow to be ejected (including in front of the vehicle, in the off chance that you need to fill in a hole). [The machine] is powered off of a single hydraulic motor and it’s able to cut up to 25 feet of 18 or 22 foot pipe per minute. It weighs 3250 pounds and attaches to the front end of a snow cat. After multiple passes, you have a perfect half-pipe. When it’s been used up a little, the Pipe Monster makes another pass, smoothing it down, but in the process making the two banks a little further apart. The angle and height remains the same, but the flat part in the middle gets progressively larger as the competition drags on. What’s Better Than A Snowboard? Two Snowboards! 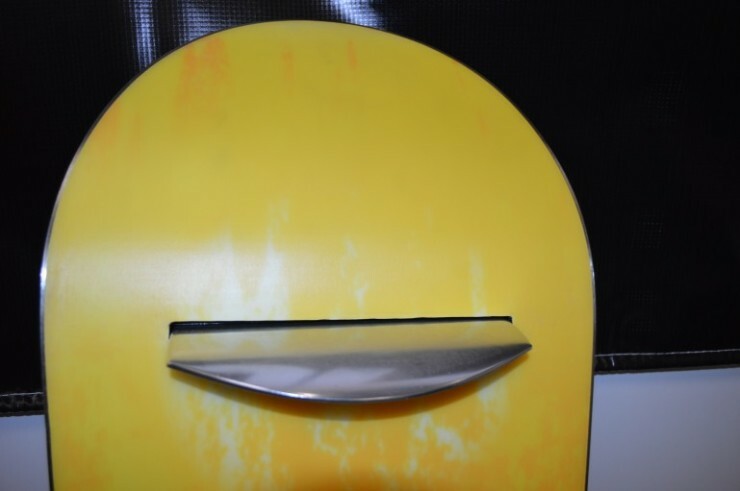 This is what happens if you take skis, shorten them to about 1 foot in length, fatten them up threefold and place them sideways on your feet. The Dual Snowboards are exactly what they sound like: one snowboard for each foot. It sounds silly. But it might not be. If you watch the video I’ve embedded after the jump, you’ll see that there might be some advantages to this quirky twist on tossing yourself down snow covered slopes. For one, your feet aren’t tied together! Also, since walking forward digs the edge of the “boards” into the snow, you can walk back up hill (why would you want to??). Also… your feet aren’t tied together! Admittedly there’d be a learning curve here, but to someone who knows nothing of icy downhill suicide games, it looks like some sort of fun. No? Anyway, you can use your regular boarding boots with them. Hit the jump to see what they look like in action. Oh and a video of a Russian crow snowboarding, because why not?